People World-Wide Must Communicate with Muslims that Abominable Verses in the Qur’an must be replaced with the Command to Love One Another. FOUNTAIN VALLEY, CALIFORNIA, UNITED STATES, August 29, 2017 /EINPresswire.com/ — Nicholas Ginex appeals to all people to communicate with one another to expose abominations in the Qur’an. Muslims must learn that it is the Qur’an instilled into their minds that prevents them to accept the knowledge, values and culture of other civilizations. A solution to ending Islamic extremism and terror is to revise the Qur’an. This scripture was used to unite the Arab people by forceful means and continues today to have Islam dominate all other religions. Muslims are indoctrinated to only worship Allah and not tolerate the worship of any other God. Their intolerance is verified as churches and synagogues are not allowed in Mecca and Medina, the holiest cities in Saudi Arabia. The people of civilized countries that have religious beliefs other than Islam have got to be vigilant and knowledgeable of a well-known fact – Muslims are indoctrinated with the Qur’an not to accept people that do not worship their Islamic God Allah. But what verses in the Qur’an are so effective that Muslims are not able to assimilate the values, laws and culture of other countries? 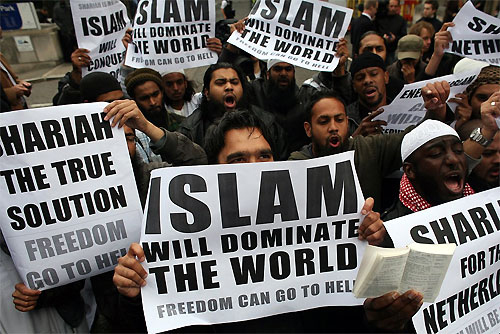 A core belief that restricts Muslim acceptance of religious beliefs of other cultures is the incessant indoctrination that Islam is “the Religion of Truth, and that Allah may make it prevail over every other religion” (Qur’an 9:33 translation by Muhammad Zafrulla Khan, 1970). This ideology promotes a sense of superiority. A superiority similar to the German indoctrination that they were a master race, which lead to WWII and the mass murder of millions of Jews. The ideology that “Islam is the Religion of Truth and Allah declares it over all religions” forms the psyche of the Muslim mind (Qur’an 9:33 translation by Dr. Syed Vickar Ahamed, 2006). It is a responsibility of people everywhere to >>EXPOSE<< the verses in the Qur’an. It is a manual that incites Muslims to become bigots, hate, violently condemn, and kill people with other religious beliefs. The historical novel, Allah, We, Our and Us provides how Islam became a Theocratic Empire in just 29 years from Muhammad’s death and why abominable verses in the Qur’an cause Islam to be a danger to all civilizations. It is available as a FREE READ. Religious scholars and many Islamic apostates have lost their lives because they could not overcome the ignorance that it is forbidden to change the Qur’an. This ignorance has created a serious world problem. Wealthy business leaders, humanitarians, news media, government counterterrorism agencies and people around the world must EXPOSE the abominable verses in the Qur’an to enlighten all to understand the danger of the Islamic religion. Education is the best source of power to expose a hateful ideology. To effectively communicate knowledge about Islam, they can purchase Allah, We, Our and Us for distribution to educational institutions, government agencies, and humanity organizations world-wide. Everything undergoes change, even the words of inspired men of God. As people become more educated and knowledgeable of the world there must be change to advance to higher levels of spirituality and humanity. To remain stagnate is to die for the ability to think has been crushed. Religious beliefs have been revised many times as demonstrated by the Egyptian Priesthood of Amon. Figure 1 shows that beginning with 2600 BCE, the Egyptian Priesthood wrote The Creation of Atum. It introduced the concept of a soul and the God Atum, creator of heaven, the earth, moisture and air. Around a 1,000 years later, the Priesthood wrote A Hymn to Amon-Re; the supreme God who was venerated as, “the Maker of all mankind, Creator and Maker of all that is.” Then around 1370 BCE, Amenhotep IV was the first pharaoh to envision God by personalizing the sun. A visionary and poet, he composed The Hymn to the Aton. Finally, in 1270 BCE, the Priesthood of Amon wrote, Amon as the Sole God. The Priesthood went full circle by linking Atum with Amon – and created the first One-Universal God. Amen continues to be spoken by many people today to give thanks for a requested or surprised outcome and sung in many houses of worship. After the Hebrews adopted many of the Egyptian beliefs of one universal god, they wrote the Torah by 950 BCE and Judaic priests wrote the Gospels that gave the birth of the Christian religion. What is notable in Figure 1 is that it was Jesus Christ that acknowledged Amen as, “the faithful and true witness, the beginning of the creation of God. (Rev 3:14)” It was these two religions that Muhammad was inspired to carry on the belief in one God. He was instrumental in uniting the Arab tribes and formed the Islamic religion. provides five verses that conclusively reveal a party of men wrote many verses in the Qur’an to indoctrinate Muslims. The PR conclusively proves that suras were written by despotic men whose objective was to conquer the lands and wealth of nonbelievers and establish Islam as a world-wide religion. More importantly, the PR reveals that many verses in the Quran were written by a party of men and therefore CANNOT be the Perfect Word of Allah. All people must EXPOSE the Qur’an as the source of discontent and Islamic terror. Through communication of the TRUTH, Muslims can be courageous to initiate an Islamic Reformation with the objective to Revise the Qur’an. To inform people why abominable verses in the Qur’an are the source of discontent and Islamic terrorism around the world, this post precedes the Press Release link below. FOUNTAIN VALLEY, CALIFORNIA, UNITED STATES, August 15, 2017 /EINPresswire.com/ — A perceptive writer on religion and philosophy, Nicholas Ginex informs people why it is the Qur’an that incites Muslims to commit bigotry, hatred, violence and the killing of innocent people who have personal or religious beliefs other than Islam. The Qur’an is used by religious leaders to indoctrinate their followers to reject the beliefs, laws and culture of people from other countries. But what verses in the Qur’an are so effective that Muslims are not able to assimilate the values, laws and culture of other countries? It is a responsibility of people everywhere to EXPOSE the verses in the Qur’an. It is a manual that incites Muslims to become bigots, hate, violently condemn, and kill people with other religious beliefs. 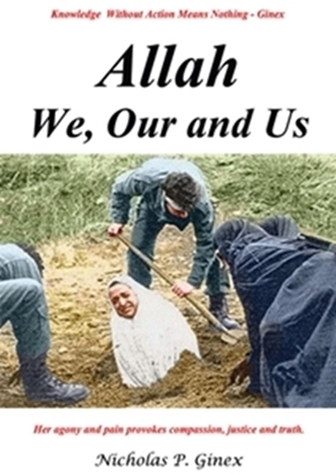 Many abominable verses are presented as a FREE Read in the historical novel, Allah, We, Our and Us. Below are five verses that conclusively reveal the Qur’an is a manual used to indoctrinate Muslims. Two decades after Muhammad’s death, a religious party of men compiled his revelations to form the Qur’an. They incorporated into the Qur’an the authority to invite goodness, enjoin equity, and forbid evil. Clearly, these are not the words of Allah but a commander or a powerful religious leader. The commander’s technique of using Allah as sanctioning atrocities has been a successful form of brainwashing or leadership to convince his fighters that the killings are not through their own volition but by Allah who supports and directs their actions. 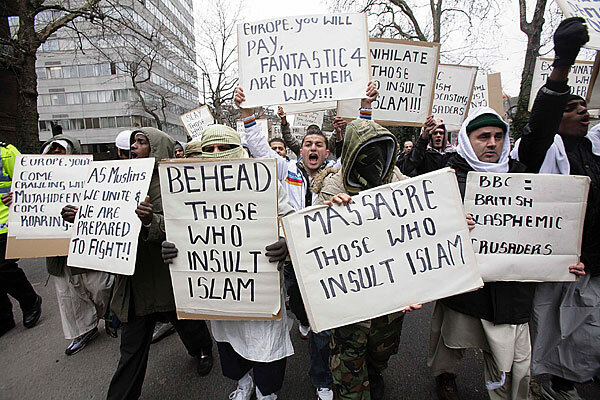 This is why Muslim terrorists yell “Allah Akbar” in the performance of violence and killing nonbelievers. Conclusion: People around the world must EXPOSE the Qur’an as the source of discontent and Islamic terror committed by Muslims. This press release reveals that many verses in the Quran were written by a party of men and therefore CAN NOT be the Perfect Word of Allah. Only through communication of the TRUTH can Muslims be courageous to initiate an Islamic Reformation with the objective to Revise the Qur’an.